The present article aims to show the dimensioning of a linear roller bearing of specifically selected series, depending on the speed and acceleration at work, as forces and friction coefficients in different parts of the bearing have been previously specified and taken into account in the calculation. 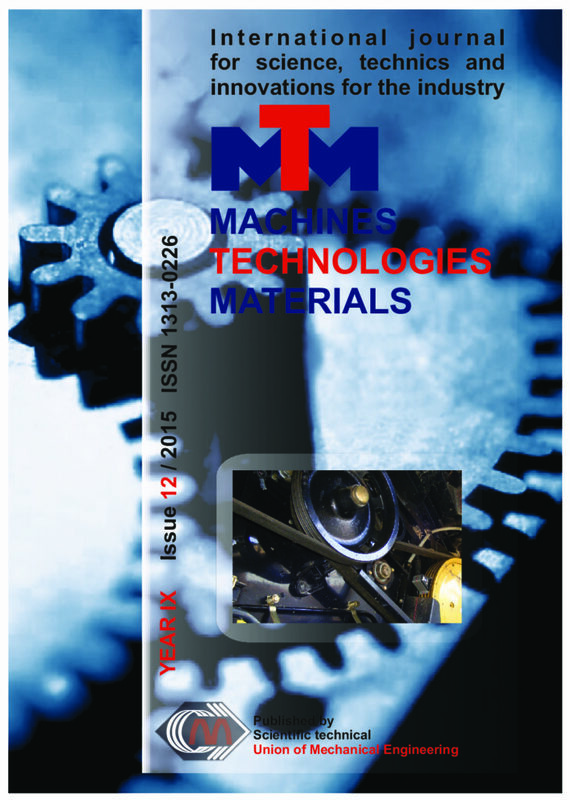 The paper presents a review of the most important triaxial testing machines and triaxial specimens from literature. It also includes a finite element analysis of a triaxial specimen. The main feature that is studied refers to the geometry of the specimen so that it is obtained a state of stress as favourable as possible for the fracture to occur. The color recorded in the image is not an inherent value of observed object, because it is also influenced by the illumination properties, as well as geometry and surfaces of neighboring objects. Numerous studies have developed and investigated image processing procedures in color sorting machines, where as not many of them have considered the influence of illumination on numerical values related to the colors. In this paper, parameters related to the color of corn have been examined. In each image, the corn has been illuminated by one of four different types of light sources. And different luminous intensities of each type of light source have been applied. The processing of obtained images has been performed in MATLAB, and parameters of images in RGB, CIE L*a*b* and HSV color space have been analyzed. Further descriptive statistics analysis has been performed by IBM SPSS. The variations of parameters with the change of light intensity, showed no statistical significance. The change of the type of the light source has a significant impact on all analyzed features. Luffing Boom Cranes are type of cranes used for load carrying in building sites. They have complex structure with big dimensions and mechanisms. Their working usage is high. Main cycles of the work of Luffing Boom cranes are: lifting and lowering the working load, Boom luffing – upwards and downwards, rotation around vertical axes, and (if mobile type) translational movement forward and backwards. In this work, we are going to study the work of this crane while rotating with full loading. Study will be done using simulations with computer applications. The aim is to see the effects of dynamic forces and moments in the crane’s main parts – metal construction, cables, and constraints during rotational work cycle, particularly at the start and end of the rotation. Also interest is to study the effects of load swinging in crane’s stability. For this purpose, we modeled with software entire luffing boom crane. Crane is modeled from standard manufacturer, as a common model of luffing boom Crane. Submerged arc welding is one of the most extensively used process for production of spiral welded steel pipes. Production process includes pipe forming by cold plastic deformation of hot rolled strips and double-sided submerged arc welding of the strip edges. The double-sided welded seam as an integral part of the final steel pipes must be carefully controlled because plays principal role on the quality of welded steel pipes. In this respect, optical metallographic analysis of the welded joint cross section were used as efficient and effective method to control the double-sided welded seam. The article presents a brief review of the role of optical metallographic analysis commonly used for quality evaluation of double-sided submerged arc welded steel pipes. The energy input in fluidized beds is usually performed by convection. In this case, the fluid stream is heated through a heater before entering the fluidized bed chamber. This method has long heating and cooling time. Therefore the purpose of this work is to find out other energy input options in fluidized beds. Such as, the induction heating is suggested. In this case, the fluidizing gas is not the source of energy, but the electrically conductive inert particles (like iron hollow spheres) into the fluidized bed, in which an induction electromagnetic field is transferred. On the surface of these particles, the heat is released directly into the fluidized bed. Here, since the heat is emitted via a large overall surface of the bed material, a very high energy density and, finally, highly efficient heat transfer can be achieved. In this way, the energy efficiency of fluidized bed processes can be significantly increased. Mixtures of 10, 20 and 30 wt. % of tungsten carbide powder and aluminum powder were ball milled for 2, 4 and 8 hrs to investigate the effect of percentages of the reinforcement and mechanical alloying time on microstructural properties of the produced composite powders. Finer particles were tried to obtain in ductile matrix. The milled powders were analyzed using X-ray diffraction (XRD). Nano/micro particle size and distribution (PSD) technique was used to measure particle size and distribution. Scanning electron microscopy (SEM) was also performed to observe particle morphology. By recycling old products mainly the elements, which are contained in large amounts in the product, are regained. Taking metal coated Waste Electrical and Electronic Equipment (WEEE) as an example, this is the plate of the component cover, which is made of steel or aluminum, the included plastic, the printed circuit board’s material and copper. Those materials, which are contained on the printed circuit board belonging to the area of specialty metals such as tantalum, indium, palladium etc., cannot economically be extracted from a shredder plant’s output mass flow. To solve this problem, a new approach for an automatic decomposition of metal coated components is introduced based on the process principle of the roll crusher. For finding a solution the systematic design approach and a first pilot plant’s results are presented. Based on these results, conclusions for future developments are derived. The present article offers an approach for more effective fundamental preparation for the work with CAD systems within the technical field of Basics in Construction. The approach is based on developed, and justified versions for practical application of fundamental computer aided designing of hydro mechanical elements and mechanical drives that are used throughout the training of students. Their 3D geometrical models present options for computer aided simulation, size analysis during designing of assembled units as well as options for training of master degree students in an optional field of Expert Systems. The obtained results are also useful for the purpose of better connections between general technical subjects and profiling subjects.